The electron spin, which does not explicitly appear in the N-particle Hamiltonian of the solid (except for the spin-orbit coupling and Zeeman terms), will be in the focus of this chapter. In Chaps. 4 and 5 we have addressed already the relevance of spin in connection with magnetic properties, which shall be studied now in more detail. The issue here will be to consider the interacting electron system with dominating exchange interaction, which leads to a spin-ordered ground state, and to describe elementary excitations out of this ground state: spin waves or (in quantized form) magnons. In several aspects spin dynamics is similar to lattice dynamics (see Chap. 3) with the masses coupled by springs now being replaced with spins (or their magnetic moments) coupled by exchange interaction. Depending on the complexity of the crystal structures on which these spin systems are realized, their spin or magnetic order can be ferromagnetic, anti-ferromagnetic, ferrimagnetic, or anti-ferrimagnetic . 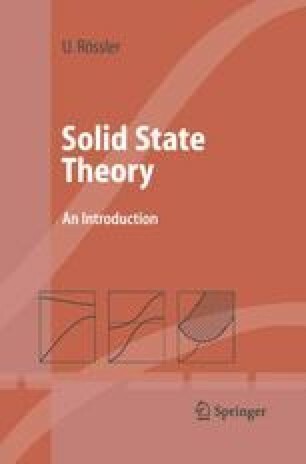 Most standard textbooks on Solid State Theory contain a chapter on spin waves or magnons and magnetic properties, but there are also special review articles [152,153] and monographs [106,154–160] on these topics. In solids with disorder, e.g. due to alloying, the magnetic order takes the form of spin glasses . Theoretical concepts developed for spin glasses have turned out to be useful also for neural networks .